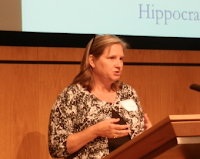 Open International Hippocrates winner Mary Bush was interviewed on 30th May 2012 on BBC Woman’s Hour. She won the �5000 2012 International Hippocrates Prize for Poetry and Medicine for her poem Women’s Work. In 2011, Mary Bush earned a Ph.D. in Creative Writing/Poetry from the University of North Texas while continuing to work in my long-term career as a project manager in the Information Technology industry. She said 'I write poetry for pleasure, and I have always been interested in the overlap of art and science—whether writing “scientific” poetry or “elegant” software. My husband and I have three adult children, one of whom is autistic, and his unique use of language fascinates and inspires me. We live in a ramshackle old house in a small town in North Texas, where my husband plays loud guitar and I write poems'. See more on the 2012 Hippocrates Awards. Judges broadcaster Martha Kearney, Paris-based US poet Marilyn Hacker and medical researcher Professor Rod Flower FRS �announced the 2012 Hippocrates Awards for Poetry and Medicine at the Wellcome Collection in London on 12th May. The �5000 open international Hippocrates first prize went to American poet Mary Bush from North Texas for her multi-layered poem reflecting on the role of women at the forefront of medical science. Writer-in-healthcare Shelley McAlister won the �1000 second open prize for a poem on health inequalities, and academic and writer Kelly Grovier won the �500 third open prize for a poem on medical archaeology.